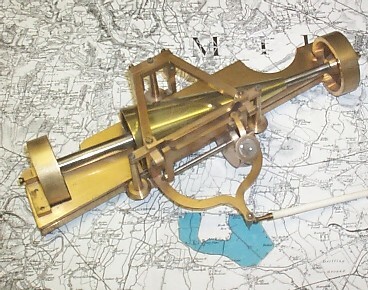 During the first half of the Nineteenth Century, the need for an instrument that would accurately measure area inspired several ingenious devices. Planimeters previous to Amsler's invention were either inaccurate, difficult to use, or cumbersome. One of the early designs had the wheel rolling on a spinning cone. Mathematically this is a direct application of the definition of the definite integral ∫ y dx: the larger the y value the higher the wheel is on the cone, and so the faster the wheel turns. Schematic of design by Johann Martin Hermann, Germany, 1814. 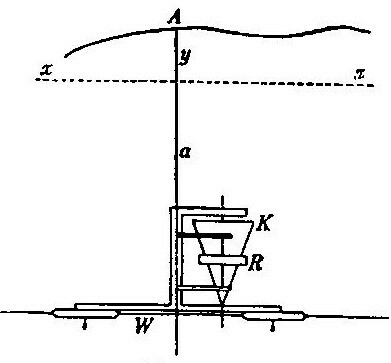 Taken from Mathematische Instrumente by A. Galle, Druck und Verlag, Leipzig und Berlin, 1912. The inventors were in good company -- one of them was J. C. Maxwell, of electromagnetic theory fame.